F Simple and Serene Living: squeal!!!! Are you a thrifter? You know who you are. You're that person who loves to hit the thrift stores and find that perfect buy. Your eye drifts upward to the highest shelf and you catch a glimpse of something pushed to the back. You carefully edge it closer as you try to see just what it is. It's quite large and bulky. Be careful!! Is it what you think it is? Oh my, it is. A mid century modern lamp at its finest and the price is $3.50. That is when you have to restrain yourself to keep from letting out a big SQUEAL!!! This is my favorite thing this week. Now all I have to do is find the perfect lampshade. Hello, my name is Diane, and I am a thrifter! I admit it! Nice find! Let's hear from 2 Dianes in a row! heehee! I LOVE this gorgeous lamp...it's perfection! And I know you'll find the perfect shade for it. I found 2 old Nancy Drew books at a book sale this week....I couldn't get to the check out fast enough! I guess I thought someone was going to take them out of my book bag! haha! Happy weekend! GORGEOUS! What a find! Yay for you! Love the curvy lines and the color, too. Woo-Hoo! The price is right and it's adorable. It has a darling squat shape! What kind of shade are you putting on her? Very nice. Great shape and neutral color that will work almost anywhere. Great find! I am a thrifter. I am also drawn to old things. By the way great find!!! What a great deal for such a beauty. I can't wait to see where it goes and what you do for a shade. I am a thrifter for sure and you got a great deal. It's really cute! I never seem to find anything at the thrift stores. I have more luck at junk stores. 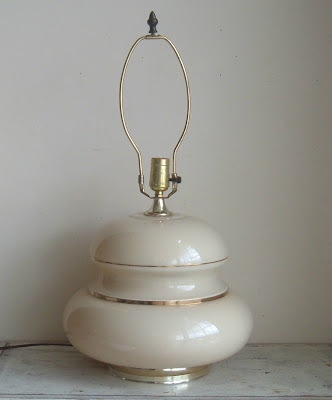 You know I'm a big time thrifter and I would have squealed when I saw that lamp! Great find!! That's a darling little lamp for only $3.50!! Can't wait to see the shade you pick for it! Great classic lines and color. Great find. 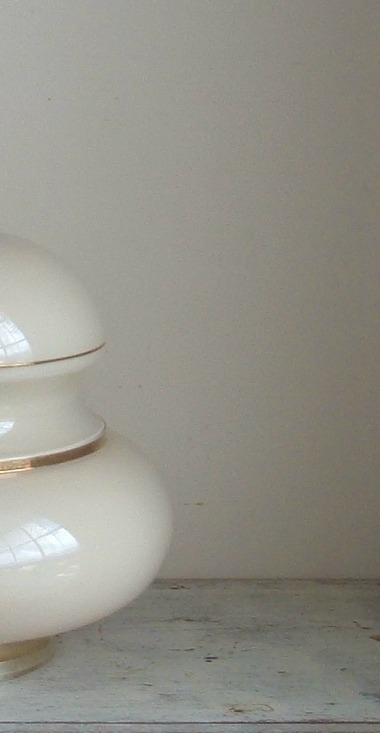 What a neat lamp - can see why you were so excited about it. I couldn't believe the cool lamps I saw at GW this week! Wanted them all but was somehow able to restrain myself. What a great find! It will go anywhere! Mmmmm, midcentury modern or white frilly shade? More fun! Three Dollars and fifty cents?! Laura, that lamp base is lovely! 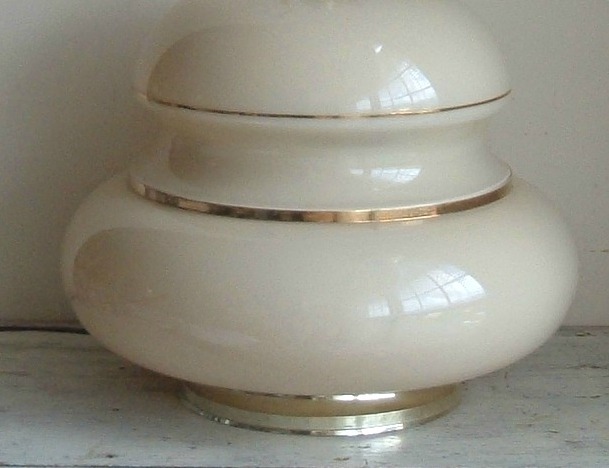 It almost looks like Lenox ware with the creamy porcelain and gold trim. I hope you find the perfect shade for it!